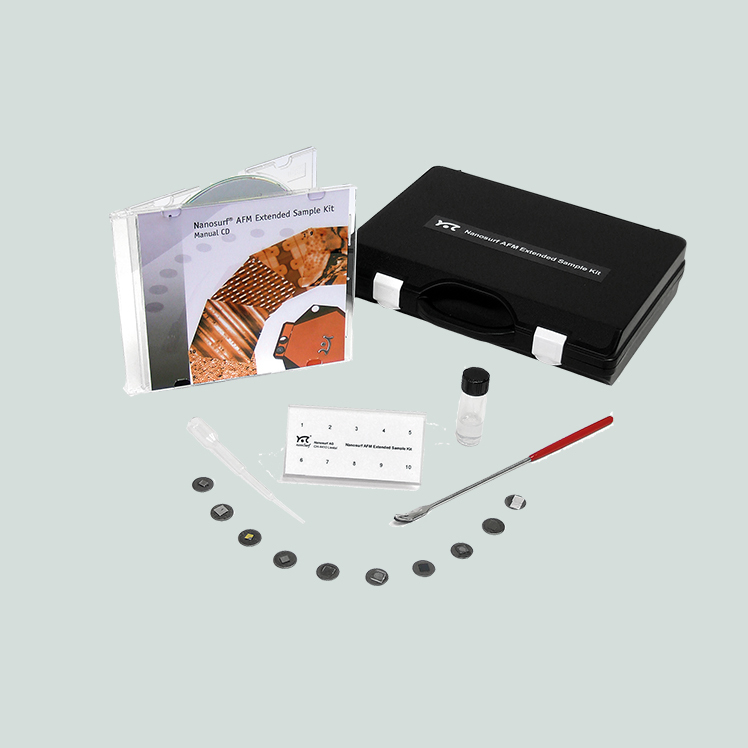 The AFM extended sample kit includes 10 samples from various disciplines, along with sample handling tools. The kit is accompanied by an extensive manual that serves both as a support for curriculum development and as an in-class guide to each investigation. Each sample is designed to emphasize interesting features of the sample itself as well as to highlight diverse elements of the AFM. For each sample, the manual provides guidance and suggestions on how to best image it and how to identify significant features. The manual also provides detailed information on each sample, such as origins, properties, and the relevance of studying it. The chip structure sample is a piece of a large wafer containing many identical formations. The reflective part at the center of the sample is the section that contains the functional electronic structures of the chip. The CD stamper sample contains a piece of the master copy of a CD. This is the original that creates the imprint in the pressed CD that you listen to. Whereas a CD will have small indentations, called pits, the stampers will have bumps in the same places. A thin layer of gold clusters on a piece of a silicon wafer. To help the gold stick to the surface, a 5 nm layer of titanium was applied to the surface before adding the gold. The gold layer is 200 nm thick. As the gold atoms were deposited on the titanium, they joined into clusters on the surface. The carbon nanotube sample is a piece of silicon wafer covered in nanotubes. A carbon nanotube is, as the name suggests, a tiny cylinder of carbon. More specifically, a nanotube is a lattice of graphitic carbon rolled into a tube. The glass beads sample is a piece of glass covered with a thin layer of very small colloidal silica (i.e., glass) particles. The beads will group in clusters,some of which exhibit crystalline structures. The bacteria sample is a glass slide covered with millions of bacteria. The bacteria have been killed and fixed to the slide, so the sample is safe to touch and scan. The sample contains a structured silicon oxide layer on silicon substrate. The square pits are about 100 nm in depth and the periodicity of the lattice is 10 µm in x and y axes. The sample is a blend of two polymer solutions spread onto a silicon wafer. Polystyrene and poly(methyl methacrylate), when mixed together, separate into well-defined regions on the silicon. The skin sample is a thin cross section of skin, protected by plastic, and fixed to a glass slide. Move the sample back and forth in the light. You can see that at the center of the slide there is a thin curve. The entire length of the curve is skin the width of which is made up of various skin layers. The aluminum foil sample is simply a piece of household aluminum foil cut into two pieces. A sheet of aluminum foil has two sides, one more reflective than the other. One of the pieces of foil has the shiny side up, the other has the dull side up. Both pieces are glued to the sample disc. Contents subject to change without prior notice.